M. Katherine Gavin, Ph.D. is an Associate Professor at the University of Connecticut in the Neag School of Education, Department of Educational Psychology. Dr. Gavin is the Principal Investigator and senior author of Project M²: Mentoring Young Mathematicians and Project M³: Mentoring Mathematical Minds, a 5-year, research and math curriculum development Jacob K. Javits grant for grades 3-5. Dr. Gavin has been recognized nationally as a leading curriculum developer. In addition to co-authoring the Project M³ units, she has co-authored two NCTM Navigations Series books and Awesome Math Problems for Creative Thinking. She was a member of the CT State Department of Education committee that developed standards for early childhood math education. Tutita M. Casa, Ph.D. is an Assistant Professor at the University of Connecticut in the Neag School of Education, Department of Educational Psychology. Dr. Casa is the Co-Principal Investigator of Project M²: Mentoring Young Mathematicians. She was a member of the Professional Development team for Project M³: Mentoring Mathematical Minds, a 5-year, research and math curriculum development Jacob K. Javits grant for grades 3-5. Dr. Casa worked extensively with teachers on how to implement verbal and written communication in their classes. Suzanne H. Chapin, Ed.D. is an associate professor of mathematics education at Boston University, with expertise in mathematical discourse. She is a co-author of the Project M³ units, an author for the NCTM Navigations Series in grades 3-5, and senior author of Math Matters: Understanding the Math You Teach, Grades K-6. Juanita V. Copley, Ph.D. is an Emerita Professor in the Department of Curriculum and Instruction at the University of Houston. Dr. Copley is a leading expert on early childhood mathematics education and has written extensively on the topic, including editing three books co-published by NAEYC and NCTM, as well as Engaging young children in mathematics: Standards for early childhood mathematics, Growing with mathematics, Kindergarten, and is currently writing a national math curriculum for the Headstart program. 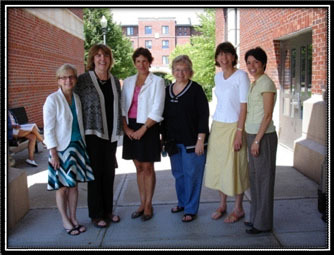 Dr. Copley directed the 2001 NCTM National Academy for Pre-K–2 teachers. She was an Instructional Specialist in Mathematics and Science for Pre-K to 5th Grade. Linda Jensen Sheffield, Ph.D. is an Emerita Regents Professor of Mathematics Education at Northern Kentucky University. She is chair of the NAGC Mathematics and Science Task Force, was president of the School Science and Mathematics Association, and was chair of the NCTM Task Force on Promising Students. Along with co-authoring the Project M³ units and Awesome Math Problems for Creative Thinking, Dr. Sheffield authored the NCTM Pre-K–2 Navigations Series, and Extending the Challenge in Mathematics: Developing Mathematical Promise in K-8 Students. Susan Revozzi Carroll, Ph.D. serves as the methodologist conducting data analyses and the external evaluator on the formative assessment component of the project. She is president of Words & Numbers Research, Inc., a consulting firm that has conducted hundreds of evaluation and research projects for the U.S. Department of Education, the CT State Department of Education, universities, schools, and other educational associations. Dr. Carroll has had her research published in peer review journals. Kathy McDermott is the Program Coordinator for Project M². She coordinates the administrative details of the project. Kathy serves as a liaison to the participating schools and teachers and helps with the administration of student testing. Kathy has a great deal of experience in elementary education. She has a B.S. in elementary education and is a former 4th grade teacher. Having worked in elementary schools for 12 years, she lends us her expertise and insights on collaborating with school personnel, parents and students. She also has previous university administrative experience.